Based on the Orange prize-winning novel by Lionel Shriver and directed by Lynne Ramsay, this is an emotional thriller about a mother who puts her ambitions and career aside to care for her son, whose irrational and unforgiveable act as a fifteen year old leave her grappling with doubt and grief. Based on the Orange prize-winning novel by Lionel Shriver and directed by Lynne Ramsay, this is an emotional thriller about a mother who puts her ambitions and career aside to care for her son, whose irrational and unforgiveable act as a fifteen year old leave her grappling with doubt and grief. 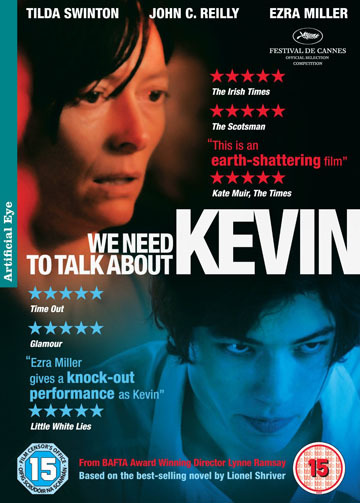 We Need to Talk About Kevin is an emotional thriller, directed by acclaimed filmmaker Lynne Ramsay (Ratcatcher, Morvern Callar) and starring Tilda Swinton. Eva puts her ambitions and career aside to give birth to Kevin. The relationship between mother and son is difficult from the very first years. When Kevin is 15, he does something irrational and unforgivable in the eyes of the entire community. Eva grapples with her own feelings of grief and responsibility. Did she ever love her son? And how much of what Kevin did was her fault? Based on the million-selling Orange Prize winning novel by Lionel Shriver.